Anxiety disorders affects more than 40 million Americans on average. The illness is a psychological state characterized by the exaggerated and persistent feeling of worry, tension, and nervousness, even when there is nothing to provoke these feelings. There are several different types of anxiety disorders, which include generalized anxiety disorder, and obsessive compulsive disorder. Anxiety is twice as common in women as it is in men. There are several causes of anxiety in women, including hormone fluctuations, stress, and certain medications. It is important to be aware of the side effects of prescription medication before you take them. The primary cause of anxiety disorders in women is hormone fluctuations - experienced during menstruation, pregnancy, and menopause. A woman's estrogen levels fluctuate, drop, and then stay consistently low during the menopause transition. Symptoms of anxiety can be divided into physical and psychological. Physical symptoms can include sweating, dizziness, increased heart rate, shortness of breath, muscle tension, insomnia, and headaches. Psychological symptoms can be anything from feelings of dread and intense fear, restlessness, and irritability to anticipating disaster. 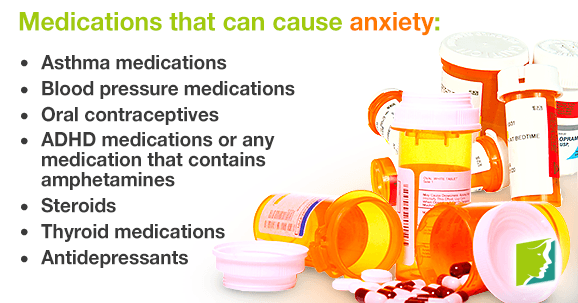 There are several ways of treating anxiety, whether it's been caused by a medication side effect or other factors. Eating healthy and getting regular exercise is crucial for reducing anxiety symptoms, like irritability and headaches. Try incorporating plenty of protein, fiber, omega-3 fatty acids, and fruits and vegetables into meals for maximum energy and alertness. Salmon, spinach, apples, almonds, and low-fat yogurt are all healthy foods that have been known to help ease anxiety. Exercising regularly is one of the most effective ways of releasing “feel-good” neurotransmitters, like serotonin. The ideal amount of exercise is around 30 minutes of aerobic activity daily. Exercising can also significantly increase energy levels, improve mood, reduce stress, and improve the efficiency of the cardiovascular system. Walking, cycling, and swimming are all good low-impact workouts. Hormone fluctuations are the primary cause of anxiety in menopausal women; however, certain medications - like oral contraceptives and antidepressants - can also cause anxiety. It is important to try out different treatment options to see which works best for you. Exercising regularly and maintaining a healthy diet can be beneficial to treating anxiety. If symptoms worsen, it may be time to seek professional help.